Apartment for Rent, Garage Sale, House for Sale—our all-weather yard signs are sure to get the attention of passersby. Yard signs can be used to let potential tenants or purchasers know all the information they need, or simply point them in the right direction. 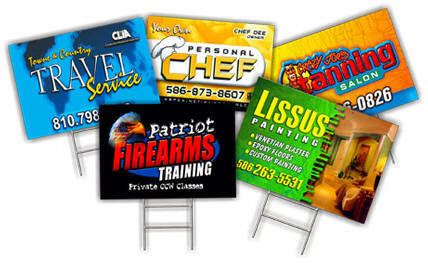 We offer a wide selection of durable and highly visible yard signs covering just about any need. And if you’re looking for something unique, we can create it for you. .........Our all weather signs are sure to get the attention of passersby. Yard signs can be used to promote a service well done, let potential tenants or purchasers know all the information they need or simply point people in the right direction. With a wide range of solutions to fit any budget we can assist you in selling or generating referrals. We offer more economical plastic corrugated stake signs to the traditional, more durable metal-framed signs. Our Corplast corrugated signs are made of durable plastic and silk screened on both sides in one color. The metal signs come in an angle iron frame and can be printed in multiple colors on either one side or two Give us a call today to find the sign you need.